Rob: What originally motivated you to do yoga service, and what continues to motivate you? How, if at all, has that motivation changed over time? Dena: Because I am a trauma survivor, yoga and meditation have been, and still are, a huge part of my path to healing. I am continually motivated by the notion that yoga is a moving meditation, and a means of surrender. Coming back to the mat makes my life work physically, emotionally, and spiritually, and brings me a feeling of inner peace and contentment that stays with me both on and off the mat. Although I continue to heal from the many forms of childhood abuse I suffered (physical, emotional, and sexual), knowing that I can hold space for others to heal and transform is what continues to motivate me as a facilitator of their self-acceptance, learning, and growth. Is there a standout moment from your work with recovering addicts? There are so many; one that I continue to experience is the humility that comes over me whenever I am working with a client who is going through detox. That person’s willingness to engage in their yoga practice even though their bodies are fragile and literally shaky from withdrawal, has been incredibly inspiring. Like the lotus flower rooted in muck, yet growing toward the sunlight, I’m continually reminded that this is what true survival and reaching for one’s best life looks like. What did you know about the population you are working with, before you began teaching? What were some of the assumptions you had about this population, and how have those assumptions changed? Not having had an alcohol or drug addiction myself, I did not know a lot about that specific recovery process. However, I do know what healing one’s life looks and feels like, so I have used my own process to shape the classes I teach. I think I assumed all the clients would be much more physically challenged by practicing yoga than they are. I have been surprised by their strength and stamina. The key difference is that in a studio, I wouldn’t practice with my clients; also I give hands-on adjustments. In the addiction center teaching trauma-sensitive yoga, I do not get off my mat because I want the clients to know where I am at all times. Also, many clients are new to yoga, so when I practice asana with them they can use not only my verbal cues, but also visual ones. Physical adjustments with trauma survivors is not permitted at the center, so I use more verbal cues to provide feedback as clients adjust their own alignment or sink deeper into a posture. The greatest challenge for me is finding a balance between encouraging clients to explore their boundaries in a posture and at the same time, wanting them to feel secure in their bodies. These are not necessarily mutually exclusive ideas but still require some forethought. For example, if I wanted to use “cultivating gratitude” as a theme for class, I have to consider that that may not be available to some clients at this point in their journey. The tool that I rely on is remembering my own healing journey, which allows me to use language and concepts that are more likely to resonate with anyone who is in the process of deep, heartfelt discovery. I know there were times in my healing when gratitude was not even remotely possible to contemplate; in fact, it brought up shame that I was unable to feel gratitude! So I might suggest clients consider whether there is any part of their lives that is positive at this moment that they can focus on. I might give them some suggestions, like the fact that they have chosen to be here to start a new journey, one that is different from the past. Or I might suggest they focus on a part of their body about which they feel positive: a big toe, the way their knee bends, or their smile. This has allowed me to connect to clients’ experience better, which in effect means I am connecting more profoundly to them. 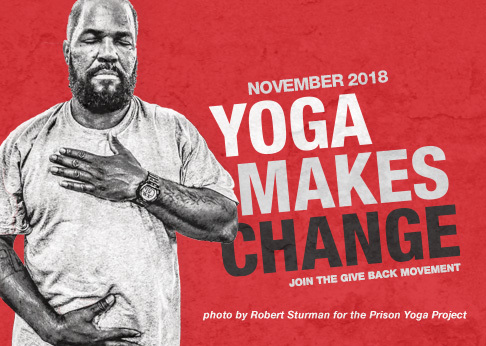 What advice would you give to anyone who is going to teach yoga to people in recovery from addictions? If the teacher has not had their own experience of recovery or healing, I would strongly recommend reading books on the topic to try to understand what clients might be experiencing. Overcoming Trauma through Yoga by David Emerson and Elizabeth Hopper is short and to the point, and although it’s not perfect, it offers some good suggestions. I believe all yoga is service yoga, but it shouldn’t stop there. We have so much to learn and reflect on to make all our teaching spaces welcoming to every single person. We need to consider how to change our yoga spaces to welcome new and diverse members of our greater communities. The current Western paradigm is that yoga is for thin, educated white women. This needs to change. We need more yoga spaces that offer adaptive yoga for people of varying body sizes, shapes, and abilities. I would love to see more donation-based studios. My home studio, Cambio Donation Yoga, is an example of the fact that this is a sustainable way to offer yoga. Donation yoga also means that the studio is much more diverse. My practice has been an affirmation of the deep impact that yoga can have on our bodies, minds, and spirits, and I’ve known I wasn’t the only one gaining these kinds of benefits from yoga. This form of service reminds me that we can all benefit from yoga, no matter who we are, what our experiences are in life, how our body is shaped, etc. And that yoga is always available — whether we are new to the practice, have taken time off and are coming back to it, or are committed to a regular practice — we can always gain some benefit from the movement as meditation in motion.